While the three non-governing parliamentary parties are preparing for their second autumn rally, the Civil Contract public-political union considers their tactic unacceptable. The group led by outspoken oppositionist Nikol Pashinyan has spoken out against both the government and the troika of opposition forces, speaking in favor of forming a “public agenda”. Since in their public statements representatives of the ruling Republican Party of Armenia (RPA) have so far ruled out that the government would conduct negotiations with the non-governing forces, political analysts have different assessments as to how effective the troika’s process on “power change” will be. On Monday, the Prosperous Armenia Party (PAP), the Armenian National Congress (ANC) and Heritage announced their decision to schedule the next rally for October 24. They did not say when they’d hold their next gathering at the Friday rally in Yerevan that attracted thousands of people. It is remarkable that ANC leader Levon Ter-Petrosyan described the “Now”, “Now” calls for immediate action heard from the crowd of supporters in Liberty Square on October 10 as “wrong” and urged supporters to obey the decisions and the timetable of action of the leaders of the struggle. At the same time, he said that fresh parliamentary and presidential elections were needed to save the country from a disaster. “Our plans and objectives are clear, so proposals on dialogue and compromise solutions should come from the government. If these proposals are reasonable, it is possible that we will meet them halfway,” Ter-Petrosyan said in his speech. Meanwhile, Parliament Speaker Galust Sahakyan, who represents the RPA, on Monday said there was no need for negotiations with the troika. “We need to understand what to offer – whether they want posts, so we can give them posts, or they want a coalition so that we offer them to form a coalition. What is it that they propose? Can anyone formulate that?” Sahakyan challenged reporters during a press briefing in Tsaghkadzor. Meanwhile, Pashinyan, who fell out with Ter-Petrosyan in 2012 over the latter’s decision to engage in cooperation with the PAP, believes that what the troika proposes is a power-sharing deal, something that he said disregards the people’s opinion. “They choose a tactic that rules out that someone else makes moves in the political field. Thus, they keep the entire field,” Pashinyan said at a press conference on Monday. Still, the troika appears to continue to remain the key format that keeps up people’s opposition sentiments. 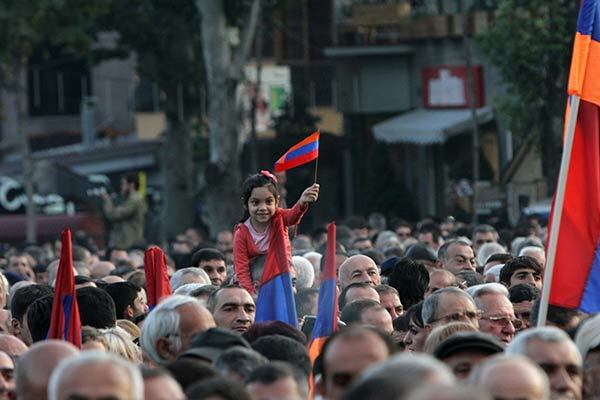 According to political analyst Armen Grigoryan, the three forces combine large capital and public support. “A rally that gathers 40,000 people during a non-electoral stage shows that they are very strong,” Grigoryan told ArmeniaNow, stressing that the process is the only hope for people who want to see changes. (Other observers estimated the turnout at the October 10 rally at between 10,000 to 15,000 people). “One of the most important things [for the opposition] is to ensure that the constitutional amendments are not passed, because constitutional amendments are the greatest threat to political parties. Everyone understands that if it happens, [President] Serzh Sargsyan will rule for his lifetime in Armenia, and that’s why it becomes the most important political factor,” said the political analyst. However, according to expert on political and electoral technologies Armen Badalyan, in Armenia the potential of political forces is not as important as the potential of society. “There were 40,000-45,000 people at the Friday rally, but if we compare that to the number of people who live in poor conditions and seek justice in Armenia, it appears to be a very low figure. If half of the workers of Armenian markets came, if half of those who complain about the red-line parking rules came, there would have been four or five times more people,” Badalyan told ArmeniaNow.